Producer Mark Singer gives an overview of the game. Dungeon Defenders is an action RPG-tower defense hybrid for XBLA, PC, and PSN. The goal is to defend one or more (depending on the level) crystals/bases from waves of opponents. To that end, players choose between one of four character classes (pictured relaxing in the thumbnail), each of which has different combat aptitudes and different types of towers they can construct. "My favorite arcade game back in the day was either X-Men or TMNT. I'm a big fan of 4-6 players beating up hoardes of enemies." 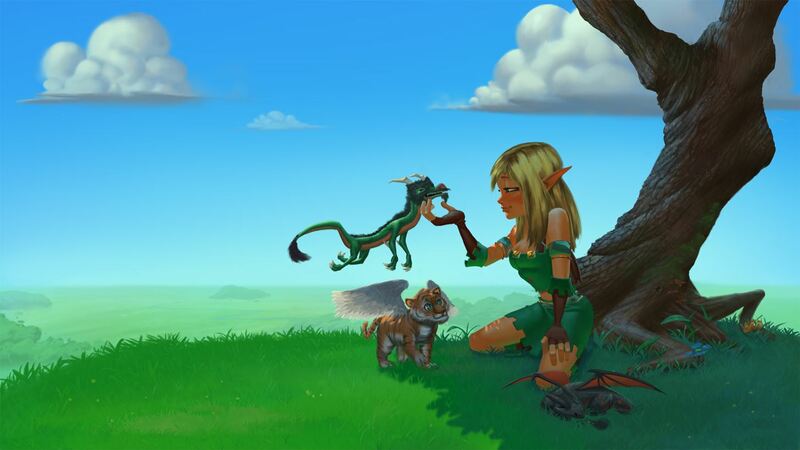 A Huntress class character relaxing with her pets. There are mountains of color-coded and differently endowed items to collect; pets to acquire, train, and trade with other players; and levels to gain with stat bonuses to grant. The items and pets are major points of emphasis, and home to a clever system that is Stieglitz' favorite part of the game: "It's very subtle. When you upgraded an item or pet fully, you get to name it, and it says it was forged or raised by you. When you trade it online, the name and stamp persist, so really prolific players might create a ton of great gear and become known online for it. I think it's cool you can put that little bit of creativity in your upgrades." Local and online multiplayer will ensure that gamers never need solo unless they want to. Trendy is starting their own cloud storage/matchmaking service that will eventually allow cross-platform play, item trading, and other cool features that couldn't have happened using Steam (who will be distributing the PC version, along with Direct2Drive and other services) or any other stock online service. "It gives us a degree of control over the state of the online game," Stieglitz said. There will only be co-op PvE and Deathmatch modes at launch, but Asher did say that a 4v4 PvP build at one point did exist in the office, and was great fun. Even if PvP doesn't make it into a future official update for the game, the PC version will include all the tools modders need to make one happen. Asher even indicated that mods will be playable using the main game's matchmaking service, making it much easier for players to find them. 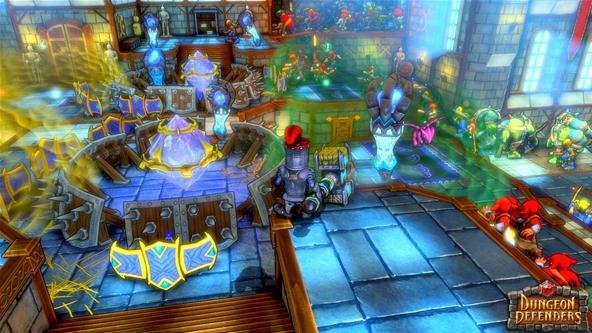 Dungeon Defenders began as a UDK development project called Dungeon Defense (you can still download and play it there), which Stieglitz and another collaborator made in four weeks back in 2009. A chance meeting soon after with serial entrepreneur, inventor, and musician Agapitus "Augi" Lye, led to the conception of Trendy Entertainment, with Stieglitz as CTO/Development Director and Lye as CEO. "We realized that game really had some great qualities that were appealing but it needed to be much grander and have a much broader range of features," Stieglitz explained about the decision to devote himself to Dungeon Defenders full-time. Lye has remained instrumental in the company's fundraising efforts during its prolonged and somewhat star-crossed development. Since the framework of the game had already been made in UDK, making the full game with the full version of UDK, Unreal Engine 3 made sense. Stieglitz made his own engine in college called Reality Engine that wound up being purchased by Epic Games (the makers of UDK and UE3), but said he wouldn't want to do it again: "Everything I've done since then (selling Reality Engine) has been Unreal Engine 3. I'd rather build a house than make hammers. Today, to make a competitive game engine takes a team of 50 engineers and years of development." Since UE3 is compatible with many platforms, Trendy started developing the game for PC, PSN, and XBLA. Like any indie studio that wants to release a game on XBLA, Trendy needed a publisher. Microsoft rules demand that it be so. Trendy found one, but before long it was shut down and they refused to return the game rights. "Be careful what publisher you sign up with. Check their finances first!" Stieglitz opined. That led to a year where the game was content complete but frozen in legal stasis before new publisher Reverb Publishing (who had been doing PR for the game previously) was able to pry the rights away from the old publisher and give the game back to Trendy, IP ownership and all, while still getting them their XBLA release. Finally securing the game's release while remaining indie was big for Stieglitz: "It's definitely my baby, and it's nice to be able to put so much of yourself into the game. If I was a game, that is what I'd be. That's a big part of the indie experience." D3Publisher has since come onboard to help publish the game as well, and Dungeon Defenders is finally nearing an October 18th release on XBLA and PC, with PSN coming at an yet-to-be-determined later date. The noble Squire character class. Having to sit on the game for a year hasn't been all bad, though. As Stieglitz reflected, "Part of me wishes it came out earlier, but I feel like it's been a good opportunity to really polish the game." The staff at Trendy needed something to generate revenue during the down time. So they ported Dungeon Defenders, Unreal Engine and all, to mobile in the form of Dungeon Defenders: First Wave. It is one of only two mobile games to use UE3 so far, and the only one on Android. It has been selling well enough that the team has continued to work on it, releasing a new version called Second Wave exclusively on Experia phones last week. "It was a risky move for us," Asher explained about the decision to take Dungeon Defenders mobile, "but it paid off and it wound up paying the bills until now." Dungeon Defenders proper got better, too. The aforementioned pets figure largely in the final game, and were mostly a product of its one-year release hiatus. Asher explained that what started as vanity familiars one could get for beating the game eventually became, in the hands of talented game designers with means and opportunity, a full-blown RPG system unto itself. Monsters can now be found and made pets throughout the game. Players can train them to suit their particular style of play, and trade them with other players online. The game likely would have been great without any pets at all, but as Asher said, "For some people, the pet system will almost double the RPG elements of the game". What that demonstrates, along with the abundance of other features described above, is that this game has way more to it than most on XBLA or PSN. It feels AAA, despite being an indie game made by a team of between 4 and 20 people at a time. And it is only going to get bigger. Stieglitz said of the first DLC episode, due before the end of the year: "We have an entire new campaign ready that's actually longer than the original campaign in the game," with "crazy new mechanics." As if I wasn't excited enough. He later summed up the scope of the game and how it will impact people: "I think they're gonna be amazed at how deep this game is. It's the closest you can get to Diablo on the consoles, and maybe deeper than that."